The new year is almost here. You may want to fix up your home to enjoy the upcoming summer and fall seasons during 2017. These home improvement ideas are not difficult or time-consuming. 1. Lift up your lawn. If the antipodean summer is a little dry, save water with synthetic grass. You will find artificial grass suppliers throughout the area with attractive turf that does not need water or cutting. The artificial turf is pet safe and durable. Water will run off and not damage the material. You can build your own putting green in your yard and not worry about clipping the grass to the right length for your golf ball. The grass comes in several colour variations and blade sizes. It always looks good and it is easy to clean. 2. Light up your rooms and save energy with LED bulbs. Change your lighting fixture to Light Emitting Diode bulbs that use less energy and last longer. New LED bulbs are available in all sizes and shapes. The newer diffused lenses spread the light around the area. The LED equivalent of a 60 watt bulb provides 50,000 hours of light compared to an incandescent bulb's 1,200-hour life span. Yes, the cost is more but the savings on electricity is also more since the LED bulb uses less energy. LED bulbs can be used for attractive and efficient outdoor lighting. These lights last longer in all weather conditions. LED lights add beauty to swimming pools. Look for areas where you can add shelves to hold books and other items. Under-staircase shelves will work if you have room. You may be able to add a small storage room under a staircase in some homes. A wine storage rack with a glass door will look good under your staircase. A wine rack is a popular addition to any empty space. Take a long look at hallways and closets. You may be able to rearrange items with new shelves. You can buy shelving that is easy to install or comes in stand-alone modules. There are always slider shelves that give you extra space. You can make small changes to your kitchen and modernise it. Start with installing new handles on cabinets and drawers. There may be more room under your sink and kitchen counter for one more shallow drawer. You can always use the extra storage space. If you don't have room for a kitchen island, buy a portable kitchen island cart. This rolling cart comes with a butcher block or stone top that can complement your counters. It offers additional work and serving space. This is also a good time to look carefully at your food storage area and determine if there are better ways to store packaged foods with shelf organisers. Your laundry room can be reorganised as well. Add a pathway using bricks, stone or gravel to your yard or driveway. You may also want to change out your garage door to a more modern, attractive model. You can change out your front door or paint it if necessary. Consider screening in a patio or deck to create an inside-outside room that will give you more use throughout the year. This change adds square footage to your home and increases its value. This is the time of year to paint your exterior walls or just fix up window sills, porches and other areas that have been neglected. You can change out your front door or paint it if necessary. And, don't forget to get your hands on window cleaning equipment to obtain streak-free shine on your windows – inside and out. 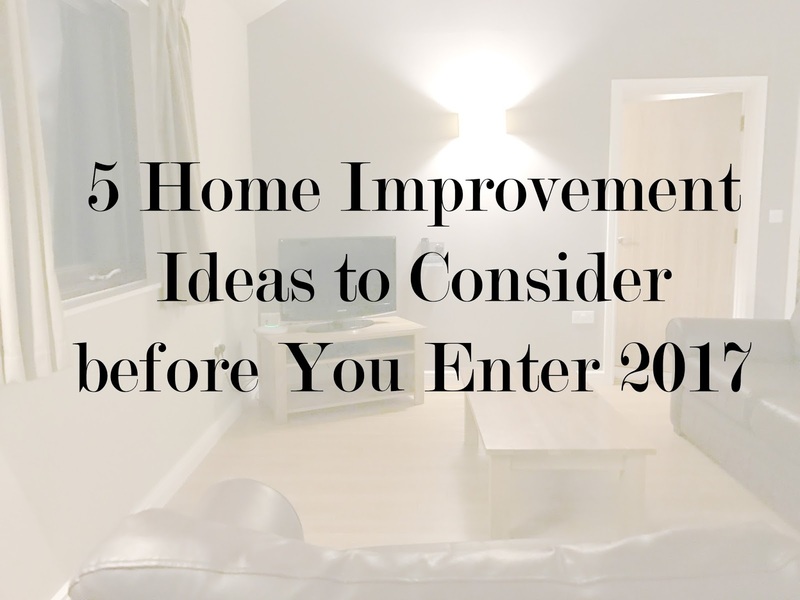 Fixing up your home is a great way to start the new year. I think is very important the number 3. Keep everything tidy and find more space. Great share.. been looking for some tips like this.. I will renovate my home later this year.. Thanks for sharing. Thanks for sharing wonderful ideas about home improvement. We can add Energy-Efficient Windows & doors in our home, It will help you save money & electricity bills. LED bulbs and Energy Star rated appliances are better for the environment, and they also help you save money.